Did you ever feel dazed when watching foreign movies with no subtitles, such as Thai movie or Japanese anime coming with their native languages, since you don't know what is said at all? Or how could you help a friend with hearing impairment enjoy a digital movie lacking subtitles, even though the movie speaks your language? In this case, to add external subtitles to a movie video could be a feasible solution. Here, this article just focuses on how to add subtitles to a movie in MP4, MKV, AVI, or other file formats for better movie watching experience. Actually, to insert subtitles to a digital movie is not as intricate as you imagine once you have a professional movie subtitles adding software, which can help you import subtitles to the movie file. 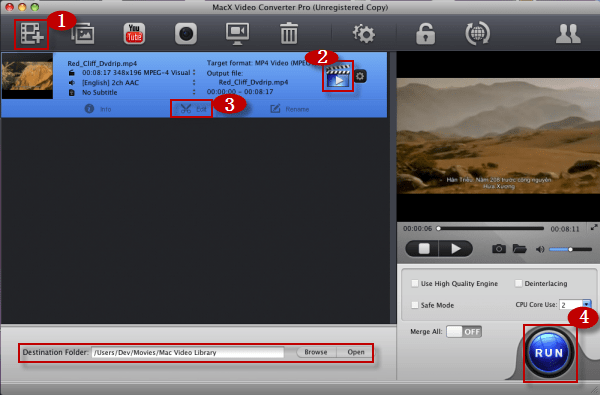 MacX Video Converter Pro is such a subtitles tool for movie that can embed SRT subtitles/captioning into a movie in .mp4, .mkv, .avi, etc. flawlessly within a few clicks. Besides the robust ability to add external subtitles to a movie video, this movie subtitles adding tool can also convert the movie with subtitles to AVI, FLV, MP4, MOV, WMV, SWF, AVCHD, MKV, MTS, etc for playback on various media players or portable devices like iPhone (6S), iPad (Pro/Mini 4), iPod, Android, etc. Then, let's have a look at how to get subtitles on your movie using the program. How to Add Subtitles to a Movie? Solved! Wondering how to merge subtitles with movie? Download the subtitles adding tool to hardcode/add SRT subtitles to MP4 AVI MKV movies and convert videos with internal/forced movie subs. There are many subtitles download sites where you can easily download the captioning or subtitles of a movie or TV show you want at websites like MovieSubtitles.org OpenSubitles.org, or AllSubs.org or simply search the subtitles you prefer from the web. Even though there is no guarantee of the availability, subtitle files are surprisingly easy to download on the net. Just do some searching using movie title "+" your preferred language "+" subtitle" as the search strings. Please make sure that the downloaded subtitle has exact the same name as the movie file. For example, if the movie file is called "MyMovie.mp4", the subtitle file should be saved as "MyMovie" plus the extension .srt, .ssa, or .aas. Both of these files should be in the same location on your computer. Step 1: Free download this movie subtitle adding software on your Mac and launch it, import the movie without subtitles by clicking "Add File" button. You can also add more than one movies or videos at a time. Step 2: Choose the output format as you like. 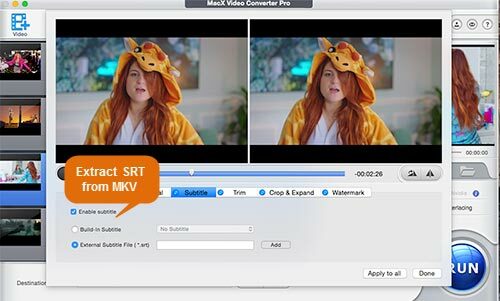 Infused with 320+ video and 50+audio codecs, MacX Video Converter Pro can easily convert video to any format as you want, such as MP4 to MOV, MKV to AVI, WMV to MOV, M2TS to MP4, etc, with fastest speed and the prime video quality. Moreover, this video converter for Mac also helps you to convert movie videos to iPhone X/8/76S/6S Plus/5S/5C, iPad, Android (mobile & tablet), game consoles (PS4, Xbox One) and more for playback on the go. Step 3: Click "Edit" button on the main interface of this software. After the "Edit" window pops up, click "Subtitle" button, hit "Enable subtitle" -> "External Subtitle File", click "Add" button to import external subtitle .srt file you've saved on your Mac, and then press "Done" button to finish to add subtitles to a movie video. Step 4: Click "Browse" button to choose a folder on your computer to save the edited movie. Finally hit the "RUN" button to start to convert the movie with added subtitles to the output format you chose on your macOS. After a few seconds, you can watch your favorite movies with preferred language track on your mobile devices as you like. 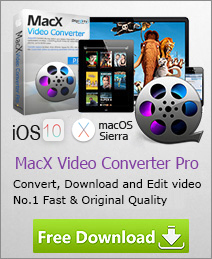 Additional information: Besides adding subtitles to movie and converting movie video unboundedly, MacX Video Converter Pro, as an all-in-one video converter for Mac, has the invincible ability to download video from YouTube, Facebook, Vimeo, Dailymotion (1000+ video audio sharing sites), record on-screen video, make stunning slideshow video from the photo gallery, etc. Just download to experience in person.